Steven Soderbergh's films are often not to my tastes, especially his "comedies" so it's no surprise that his first directorial effort since 2013's Side Effects (remember that? no? shocking!) left me without a smile on my face. He makes the kind of smug silly comedies which I just don't funny. It's all about simply being absurd, not absurd with a reason or purpose, just absurd as if that's funny enough. And funnily enough, I don't find that enough to be funny. But even if you did I question how funny you'd find the film. The audience I saw it with barely cracked a giggle other than a few times. You've all seen the "in-car-cer-ate-ted" line in the trailer? I know, not funny. Yet that's kind of how all the jokes play out in this misguided heist film. And this is a man who should know how to make a heist film after the rather successful Ocean's movies. 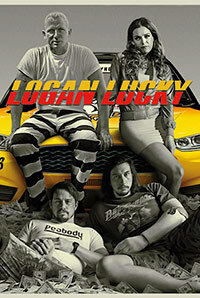 But the plot in Logan Lucky is so reliant on coincidence and perfect timing that it's hard to ever believe they pull it off. Part of the fun of a heist film is watching a plan come together, usually go off the rails, and see our heroes pull it back together. None of that is here. There is just a series of unlikely events that go pretty much like clockwork, but don't make a lot of sense. Instead of smiling, I was wincing through most of it. It seems like all Soderbergh thought he needed to do was through a bunch of A-listers at us acting silly, extra points if they can be making fun of southerners (a BIG part of this film is the way we are to laugh at accents, trashy clothes, and hillbilly lifestyles), and we'd love it. What's missing is the writing. There are no amazing moments, interactions between characters, clever speeches, reflections, hilarious anecdotes. There is just a lot of goofballing. The rumor is the "screenwriter" on this film is simply a made up person and that Soderbergh wrote it himself, or perhaps his wife did. If I wrote this, I'd use a fake name too. But I will give him points for his eye. Sodergergh films this as if it is a magnum opus and there are moments beautifully crafted in the film. Sure it was beautiful but it was also damn boring so I'm not sure that makes up for any of it. Personally Logan Lucky appears to be evidence that Soderbergh should go back into retirement.